2 filters are good for 3,785 liters of water or 1 year, whichever comes first. Made of safe non-leaching plastic. Berkey PF-2 reduction elements are especially designed for use in conjunction with the Black Berkey water filters to adsorb the following unwanted elements found in drinking water. The number of PF-2's must always correspond with the number of Black Berkey filters installed in the upper chamber. For example: 4 Black Berkeys (2 sets of 2) would require 4 PF-2s (2 sets of 2), and so on. The PF-2 shell is made from safe, non-leaching Polypropylene #5, this is a BPA-Free plastic and is used for food containers such as ketchup bottles and yogurt containers. 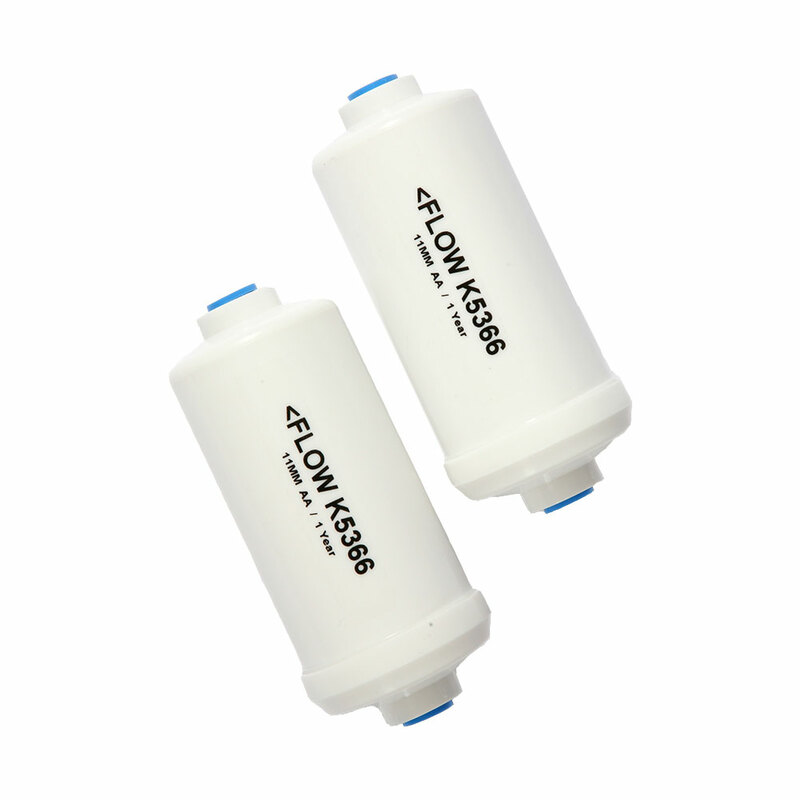 PF-2 filters reduce filtration flow rate by 15-20%. Do not boil the PF-2 filters. Under normal conditions we recommend that each set of two PF-2 filters be replaced after approx. 3,785 liters. For instance the Royal Berkey system is about 12.3 liters, therefore the PF-2 filters should be replaced after (3,785/12.3) or 307 refills. If the system is refilled about one time per day, the PF-2s should be replaced after 10 months, if the system is refilled about twice per day, the PF-2s should be replaced about every five months. Actual capacity is dependent on the presence of other competing contaminants in the source water. High levels of fluoride, arsenic and heavy metals may reduce the capacity and efficiency of the elements. With blue caps in place, wash the exterior of each PF-2 water filter with a mild dish soap. With clean hands, remove both blue caps from each end of the PF-2 water filter. Place the rubber-priming button (tan colored) onto one end of the PF-2 water filter and align the hole in the button with the hole in the PF-2 water filter. Press the priming button up against a sink faucet so that the priming button creates a seal between the faucet and the PF-2 filter. While holding the priming button against the faucet, turn on the cold water gently and allow the water to fill the cavity of the PF-2 water filter and discharge from the opposite end. Allow the water to discharge for at least 20 seconds or until the water runs clear, whichever is longer. Hint: Place your thumb on top of the faucet to apply pressure creating a tighter seal. Now repeat the process by turning the PF-2 water filter over and priming the filter from the opposite end in the same manner. Prime each additional PF-2 filter repeating steps 3-6. Remove the upper chamber from the filtration system and place it upside down on a counter so that the stems of the Black Berkey elements are facing upward. With the water flow arrow pointing away from the upper chamber (the PF-2 water filters have threads on one end only) screw the PF-2 water filters onto the stems of each Black Berkey filter 8 revolutions. Attention: a) Do not screw the PF-2 filter on more than 8 revolutions as this may damage the internal media screen b) The flow arrow should point away from the upper chamber. Replace the upper chamber onto the lower chamber (the PF-2 water filters should now be hanging in the lower chamber). Fill the upper reservoir with water and let it drain into the lower chamber. When the lower chamber is full, discard this 1st batch of water, which may contain some residual process dust. Your purification system is ready for use. Attention: On a rare occasion it can take up to 5 full chamber flushes/batches before the dust subsides. If the dust does not subside after the 5th full batch of water, please contact us for potential replacement. While the above results indicate that the residual process dust adds a minute amount of activated alumina to the water, theBlack Berkey water filters reduce aluminum from the water. We tested water that naturally contained .320ppm aluminum and filtered it through the combination of the Black Berkey and the post conditioned PF-2 filtration elements (5 cycles). The results showed a net reduction in aluminum contamination (Raw influent: .320ppm - Effluent after passing through the Black Berkey and PF-2 elements: .232ppm). Again, the standard tests cannot distinguish between aluminum (Al) and activated alumina (Al2O3), which is inert. Nevertheless, the tests showed a net reduction by the Black Berkey filter element in the combination of naturally occurring aluminum plus any residual activated alumina (Al2O3) process dust from the PF-2 elements. What is the best way to keep the PF-2 filters when away for more than a long weekend? There is some conflicting info on the internet. Do I have to put them in the fridge? The Berkey PF-2 filters can be stored in a refrigerator, short term; but definitely don’t store them in a freezer. To do this, unscrew the PF-2 filters from the Black Berkey filter, put them into a sealable sandwich bag or container and place the filters in the refrigerator towards the front to ensure that they do not freeze. If you do store them in a refrigerator, we recommend re-priming the PF-2 filters for up to 1-minute each in both directions, before using them again. The Berkey PF-2 filters should not be allowed to air dry as this could allow some bacteria growth in the filter to occur. The active ingredient in the PF-2 filters is activated alumina. Isn’t that the same as aluminum and aren’t there then health concerns with exposure to aluminum? Could you tell me exactly which types of fluoride the PF-2 fluoride filters are able to filter? The PF-2 filters will remove all fluorides which are added to drinking water whether it be H2SiF6, Na2SiF6 or sodium fluoride. I am interested in buying one of your water filters. I really need a filter that removes fluoride and notice that the systems come with 2 Black Berkey filters. Is there any way that you can order it with 2 PF-2 fluoride filters instead as I would not use the Black Berkey filters if they do not remove fluoride? Every Berkey system does indeed come standard with 2 Black Berkey filters, the PF-2 fluoride filters are not stand alone filters and are supplementary to the Black Berkey filters. They can be attached to the Black Berkey filters if you live in a fluoridated area. The Black Berkey filters are placed in the upper container and the PF-2 fluoride filters are attached to the stems of the Black Berkey filters and hang in the lower container, the water passes first through the Black Berkey filters and then through the PF-2 fluoride filters. I have installed the PF-2 filters into the Travel Berkey water filter and accidentally screwed it all the way in instead of just 8 full revolutions. The manual states this could damage the internal media screen. Is there any way how to test whether the filter is damaged or not? Yes, you would be continually getting alumina particulate in your water, which gives a bitter taste and shows up as white particulate in the lower chamber. You may have bit of this in the beginning, it can sometimes take up to 5 full containers to dissipate, but after that it should be clear and tasteless. I would suggest unscrewing a bit and it should be fine. By the way alumina is an inert compound and has no effects on living tissue.